Please visit my new website at domokume.com to view the most current styles. All of my mokume gane bands are made at completely from scratch. No outside made billets, laminated bars or patterned sheets are used. All bands are made starting with sheets of colored golds and/or silver which are fused into solid billets, forged, patterned, and fabricated into custom made bands. Additional examples of rings made over the last few years are shown below. Certain past rings can still be made on a custom order basis. Please Contact me for questions about custom rings. 1. This is a 7mm 18k yellow gold and sterling raindrop pattern band with 18k yellow gold rails. The sterling has been etched to add texture and bring out the pattern. This ring can also be made without rails. 2. 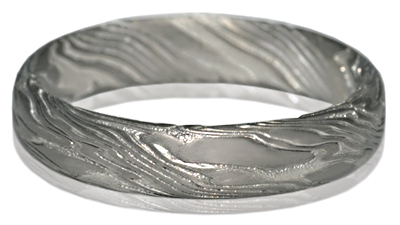 This star pattern mokume band is made with 14k palladium white gold and platinum enhansed sterling silver. The palladium white gold is the darker of the metals. One seamless piece of 14k palladium white gold tube was used to make the liner and rails. It is 6.5mm. 3. 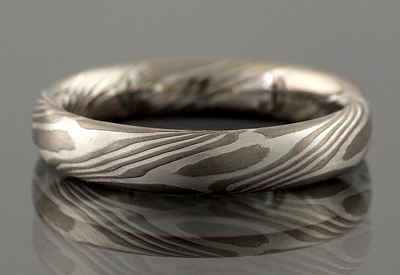 This is a 4mm twist pattern mokume band made with 11 layers of 14k palladium white gold and sterling silver. The sivler has been etched. 4. This ring combines 18k royal yellow gold, 14k palladium white gold, 14k red gold and platinum enhansed sterling. It's pattern was created by twisting 2 times an selectivly removing metal. 5. This is a 4mm star pattern ring with broad lines. It consists of 18k yellow gold, 14k palladium white gold and sterling silver. 6. Here is another variation of the classic woodgrain mokume gane pattern, with 14k palladium white gold and platinum sterling silver. The silver has been etched and it's 6mm wide. 7. This is a random woodgrain pattern. The ring is 4mm and the platinum sterling has been etched. Below is a table listing metals that I use in my mokume gane bands and other metals. 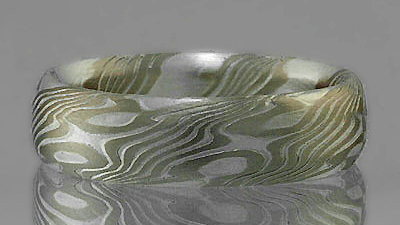 so is not appropriate for every day use in mokume gane bands. can be etched. 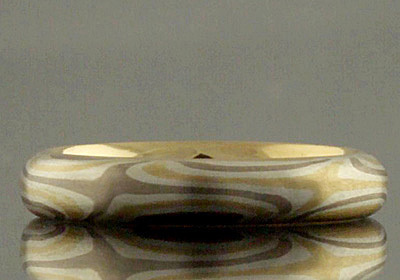 The outside and inside of my mokume ban can be etched or just the outside. My mokume gane rings are available in comfort fit profiles. on the comfort fit profiles because there is more surface area to show the pattern. are comfort fit, taller bands feel more comfortable and are more wear resistant. 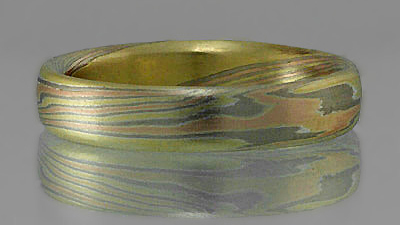 and women most often order the 4mm or 5mm mokume gane bands.